Encouraged by the return of the frogs, I’ve decided to give their hotel a bit of a spring renovation. Their hotel is basically a big pile of stones, broken bricks and broken slates in the North-East facing corner of the garden. I did put in a small pond in that corner for them, but over the last couple of years that corner has become so overgrown, and has such a dark aspect anyway, that the pond plant I put in died and the pond became really stagnant and unpleasant. It also filled up with fallen leaves which made it even more uninhabitable. Last autumn though I cut the plants surrounding that corner right back. There was also a large tropical fern in that corner which doesn’t seem to have survived the winter. The upshot is that the corner is much lighter and more open than it was. 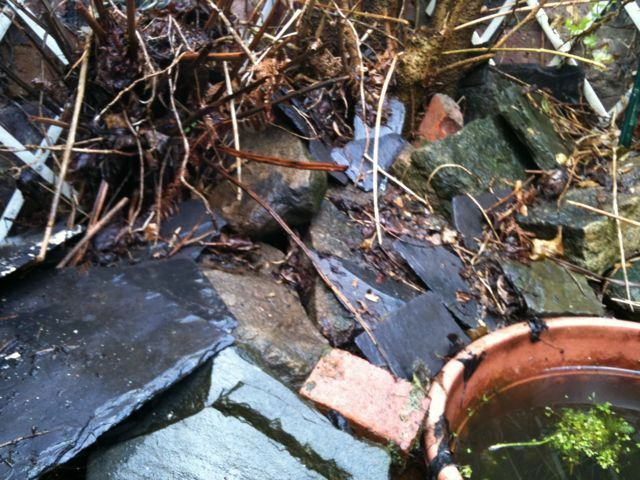 With a trowel I took all the rotten leaves out of the pond and spread them around it on the soil. Then I put a layer of wood ash over, as I had to empty my ash pans anyway (still having evening fires as it’s still cold!!) so that was handy. Finally a layer of compost. I have some raspberry canes in a pot in another part of the garden, but I’ve only ever had three raspberries off them, so I ripped out a few canes from the pot and stuck them in around the pond, hopefully they will take. 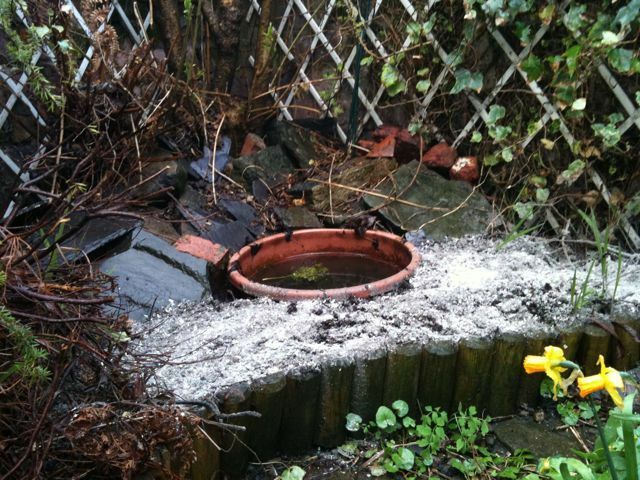 I watered them and put some stones in between them to stop the cat digging them up when he finds the nice fresh soil. 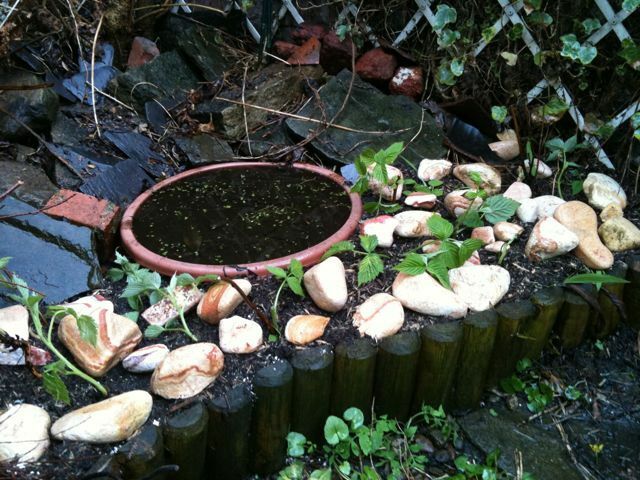 I built up the pile of stones a bit more too for the frogs. All the while dodging the raindrops, we’ve had some severe April showers today!! !